Got Online Reviews? You'd Better! Home → local search → Got Online Reviews? You’d Better! Whether or not you have online customer reviews can make or break your online visibility and also affect your conversion rate. According to a survey by BrightLocal, nearly 9 out of 10 consumers trust online reviews as much as a personal recommendation from family and friends. That may be surprising to you, considering those reviews are probably posted by complete strangers. Nevertheless, your own experience and that of your friends and family almost certainly bears this out. 88% of customers sought and trusted online reviews in 2014. Not only do consumers read and trust online reviews — they actually help you to rank higher in Google, Yahoo & Bing. The state of your reviews online ranks 5th among the most important search ranking factors according to Entrepreneur Magazine. As you probably know, showing up in the Local Pack is like gold for a local business. It’s been reported recently that Google’s “Local Pack” is now filtering out businesses with fewer than 4 stars. If you have problematic reviews, the best remedy is to encourage more delighted customers to review you. … getting reviewed on as many sites as you can will help your business. … If you’re not encouraging your customers to write reviews of your business online, you’re missing out on a great way to gain perspective [sic0000000000] customers’ trust and get them to try your business. 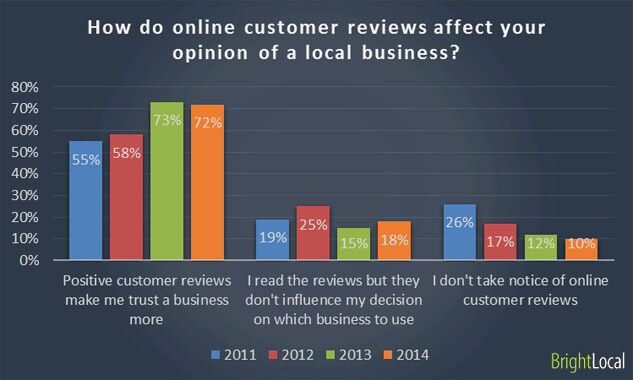 Only 10% of people ignored online reviews in 2014. Forbes says that as online reviews increase in importance and more of your competitors start doing more to encourage customer reviews, your involvement is only going to become more important. 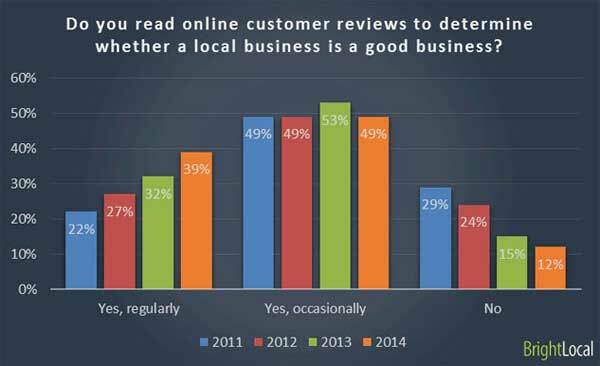 Search Engine Land pointed out that only 1 in 10 consumers ignored online reviews in 2014 (down from 12% in 2013). The trend is clear from the chart above: this percentage is decreasing each year. Having more reviews online will also give you a higher conversion rate according to Forbes. Your conversion rate is the number of people who convert from being visitors on your site to being actual paying customers. Note that even if your reviews aren’t all good, they still help. 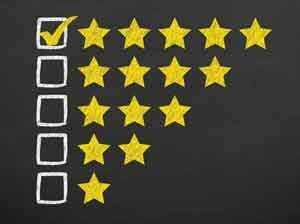 As counter-intuitive as that may seem, bad reviews can have a positive effect on your conversion rate. A blend of good reviews and bad reviews shows that you aren’t trying to hide anything, and makes the good reviews seem more sincere. And if you respond to bad reviews positively, that can leave a very favorable impression of you. You might want to check out our advice for dealing with bad reviews. Nearly 9 of 10 consumers trust online reviews as much as recommendations from family and friends. 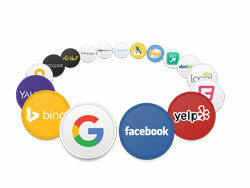 Sites which host reviews include Google, Facebook, Merchant Circle, Yelp, Show Me Local, and many more. The more reviews you have on these sites, and assuming you average 4 stars or better, the more likely you are to show up in Google’s Local Pack. Those are referred to as “third-party reviews” because they appear on websites that you don’t own. First party reviews are reviews that show up on your own website. You may think that reviews on your own site would be viewed with a certain degree of suspicion, but that doesn’t seem to be the case. First party reviews do actively contribute toward better search rankings. It’s possible to format reviews on your website with special markup that allows Google to display the stars from your own site when you show up in search results. Your reviews and stars might even show up in the large site profile at the top right of search results in Google when people search for your name. So it’s a good idea to enable customer reviews on your own website. Clearly there’s an advantage for you to encourage reviews from delighted customers. Don’t offer incentives for reviews, but make it as easy as possible for people to review you. We have a program that makes it particularly easy to encourage customer reviews. It can also spread them out so that they are balanced across third-party sites and your own website. Call us to find out how that works. We value and encourage your feedback in the Comment section below. I totally agree with you. Online reviews really help. I myself search for reviews before I order a product from an online store. Using third party sites are good, but someone should also capture reviews on their own site like Amazon and big companies do. They should also show the rating in SERP. People usually click on search results that show ratings. It improves CTR and ultimately user experience which leads to improvement in search rankings. Thanks, Tauseef. I agree about the value of having reviews on your own site. They’re called First Party Reviews and I have a few clients using PowerListings Ultimate to do just that.